Last week we reported risks of a deeper correction to US and global equity markets. Subsequent strong advances across Asian, European and US stock markets and averages have rejected a more negative theme and seen risks flip back to the upside into early April. This morning has seen strong gains driven by optimism from Chinese Purchasing Managers Index data, particularly for Manufacturing. Here we focus on the US benchmark average again, the S&P 500, but first the German flagship index, the DAX. A firm advance Friday and again this morning with a bull gap through a key resistance at 11640, to shift the intermediate-term outlook back to bullish. Furthermore, this bull gap driven advance (gap at 11601.5-570) has built on Friday’s push through resistances at 11513/521.5, plus on the late March rebound, to leave risks to the upside for Monday. We see an upside bias for 11666 and 11685.5; break here aims for 11750.5, maybe the cycle peak at 11840. But below the support gap at 11601.5-570 aims for 11508 and maybe opens risk down to 11456.5. 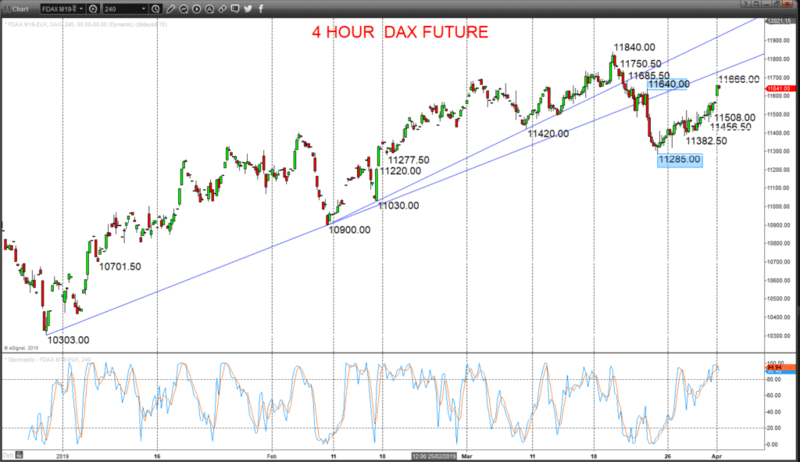 Intermediate-term Outlook – Upside Risks: We see an upside risk for 11840/46. Higher targets would be 12000 and 12455. What Changes This? Below 11285 shifts the intermediate-term outlook straight to a bear theme. A solid rally Friday above notable 2835.0 resistance and a bull gap this morning (2844.5-40.75) through 2851.75, to build on last week’s rebound attempts, for now rejecting bear pressures from the prior March selloff from a new cycle and 2019 high at 2866.0, to keep risks higher for Monday. The late January push above 2690.5 shifted the intermediate-term outlook to bullish, BUT concerns are growing for an intermediate-term shift back to neutral below 2726.5. 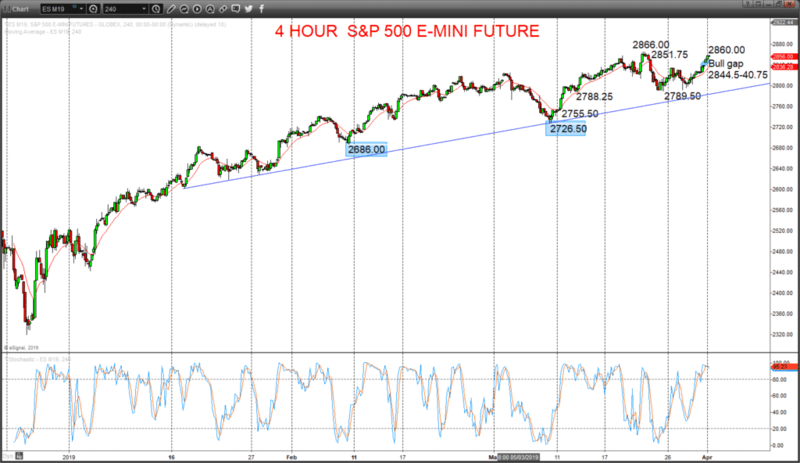 We see an upside bias for 2860.0 and the 2866.0 cycle high; break here aims for 2875.0 and maybe towards 2886.75. But below the support gap at 2844.5-40.75 aims for 2820.25 then maybe towards 2802.5.